Enhancing differentiation, design and image thanks to the most sensual dropper on the market. 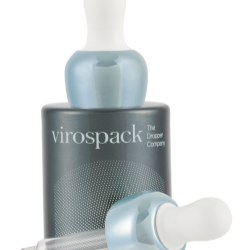 Virospack has recently given the classic dropper a makeover with an original curved design of both the bulb and the cap. The new dropper with its delicate rounded lines is more eye-catching and sensual. A new bulb reference with a curved appearance that distinguishes it from others in the line. Two references of curved caps that combine perfectly with the new curved bulb and fit standard 20/410 bottles. The curved bulb can also be combined with other existing caps in the Virospack catalogue. The droppers can be decorated as required. The bulb is available in rubber and the collar is plastic. The company offers a different decoration finishes such as painting or metallization and the bulb can be moulded in colour so that customers benefit from a seductive dropper dispenser pack completely personalized for their brand. Following the trends in other sectors like accessories or decoration that play with lightening finishes, full of subtle shines and luxurious reflections, Virospack proposes a line of metallized finishes which can be colour matched to any of the latest colour trends. The Dropper Company ensures a fully customized final set based on the positioning of each brand. Virospack's curved seductive cosmetic droppers.